Today was an awesome 10 miler! I was unable to run with my cousin because I had a conflicting schedule, but it seems like he made it out okay. Also, congrats to Krystle who ran in the Nike Women’s Marathon today! Ok, on to business. My pace group didn’t really have a leader today, so I tried my best to keep us on pace. I am training with the slowest group because I am making the leap and running two marathons within a short time frame (January and March). We were supposed to be at a pace of 17 minutes per mile. Very easy…practically walking the whole time right? Well, for some reason we were at a pace of 14-14:30 per mile. Not bad if you ask me. Especially for 10 miles. We had some stops along the way for bathroom breaks and water stations…and I made sure to stop the watch during these breaks because I wanted to time our actual running and walking. Our route was very nice. 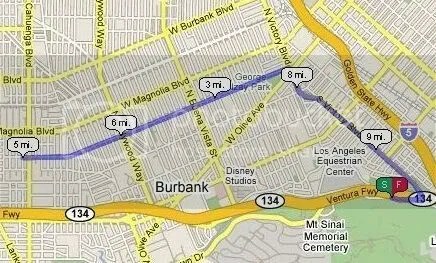 We ran out of Griffith Park and through Burbank and Studio City. It was a simple “out and back”. Five miles out, and five miles back. It started getting very hot after a few miles, but I did a great job of keeping myself hydrated as well as salted (to prevent hyponatremia). Also, while I’m writing this, a quick update. Krystle just called and is coming up to the last mile of the Nike Women’s Marathon in San Francisco. You go girl! I am soo proud of you and you’ve come a long way with your running over the past year. Back to business again. I am facing no injuries of tightness in my muscles. No foot pain or shoe problems. I am so excited about this, because when I ran in this (same) training program last year, I could barely walk after the 10 miler. It’s funny that when you stick to a program like this, you improve over time. This week I had two “maintainance” runs of 35 minutes each. This helps keep the blood flowing in my legs. Also, I ate plenty of bananas over the past few days. LOVE IT! One last thing before I post the map of my run. Please help me raise $1500 for AIDS Project Los Angeles. I MUST raise this amount by December, so please help me. Any donation will help! You can donate as little as $5. Please donate by clicking here. It is a secure form, so all your information stays safe. If you donate $100 or more, you will receive a receipt in the mail.